In 2006, Keith Ellison became the first Muslim elected to Congress. He took the oath of office on a Qu’ran from Thomas Jefferson’s personal library. This prompted Denise A. Spellburg to write a book on the subject titled Thomas Jefferson’s Qu’ran: Islam and the Founders, published in 2013. It explores the role that Islam played in influencing Thomas Jefferson’s viewpoints, readings, and his eventual penning of the Declaration of Independence. In a podcast hosted by Joan Neuberg at the University of Texas at Austin, Neuberg and Spellburg delve into how Thomas Jefferson’s interest in the Qu’ran began and the different ways in which it influenced him. As a Founding Father, Thomas Jefferson had several prominent dealings with Muslims and Islam. He negotiated with a Muslim ambassador in London in 1786. He also hosted the first Tunisian ambassador to the United States at the White House in 1805. However, his study of Islam began when he purchased the Qu’ran from a bookshop in 1765, eleven years before he wrote the Declaration of Independence. He purchased the most up-to-date translation of the Qu’ran, translated from Arabic into English, with a two-hundred page preface that summarized Islam. 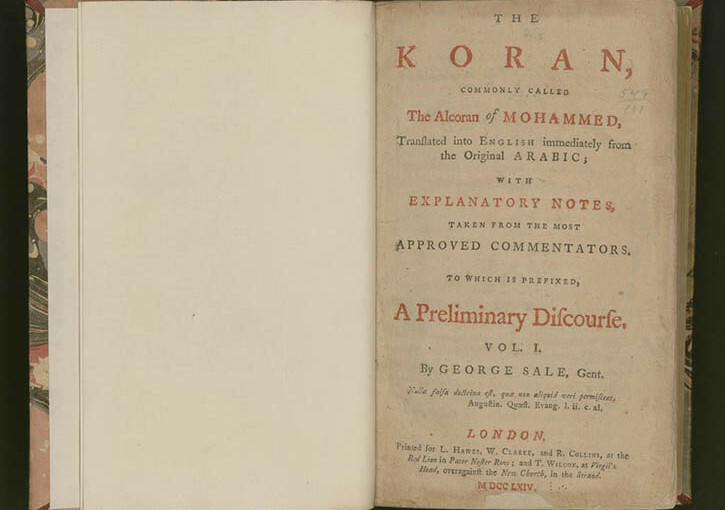 Rather than use the Qu’ran as a means of studying Islam; however, Thomas Jefferson used it to reinforce an existing British legal precedent – that Muslims were not enemies under the guise of English legal thought. Jefferson explored the Qu’ran and predicted that Muslims would one day become citizens. Under these auspices, he reasoned that they had to be included under any legal framework. At this time, a movement for greater religious tolerance was sweeping across England. English Baptists were promoting freedom of religious practice for Catholics and Jews. Jefferson’s consideration of Muslims as potential citizens caused him to include Muslims under this umbrella of state toleration of religion. Jefferson’s views on tolerance were not motivated by clemency, but by a desire for a state to exist without violence or upheaval. If Muslims were allowed to practice their religion in freedom, this would lead to a peaceful, civil society. Muslims were more feared than Jews and Catholics, but Jefferson insisted on including them in his theories on universal toleration. Despite his advocacy for universal religious freedom, Jefferson did not adhere to these principles in his personal life. Both he and George Washington were unwittingly in possession of Muslim slaves. They were unaware that some of the slaves brought over from Africa spoke Arabic and were practicing Muslims. Despite this contradiction, Jefferson’s perusal of the Qu’ran led him to include Muslims under his religious freedom doctrine. This inclusion would carry through to his authorship of the Declaration of Independence, and then to the Constitution of the United States, where freedom of religion is guaranteed in the First Amendment. In the aftermath of 9/11, with the spread of Islamophobia and a general mistrust of Islam, it is important to maintain a historical perspective in which Muslims were always intended to possess freedom of religion along with Jews and Catholics. A society in which Muslims are persecuted for their beliefs would have been as foreign a concept to Thomas Jefferson as persecuting Catholics and Jews in the United States would be to contemporary American citizens. The groundwork for the election of Congressman Ellison was laid in these formative 18th century musings on the Qur’an and Islam.